Monday March 20th 1922 I did some ironing in forenoon. In afternoon we all went to The Unitarian Church parlors to an entertainment by the Shakespeare ladies. Letter from Lydia. wrote Ida in the evening. Hattie home from Otts at noon. Tuesday March 1st 1922 Cora did some washing today. I cleaned up the little bed-room for a girl that is coming to work tomorrow. Hattie did some ironing. I walked to town late in afternoon for treatment. Wednesday March 22nd 1922 I did a lot of washing for myself. The girls came to help got the dinner. We rode in Otts car in afternoon, Rob driving. The folks went to a style show in evening. I read a book. weather cold. Thursday March 23rd 1922 I did my ironing in forenoon. I went to town in the PM with the girls. They went to a meeting and I to a picture show. I wrote to Joe Woolf in the evening. Rob & Cora in town. weather pleasant. Friday March 24th 1922 I was sewing some in AM, washed curtains. I had a letter from Lydia. Went to town with the girls soon after dinner and to The Library where I wrote to Lydia. Took a treatment. Read in evening. Saturday March 25th 1922 I ironed my curtains. Did some sewing. Late in afternoon went to call at Chalfants. They have lost their daughter. Letters from Ida & Joe Woolf. Rode home with Rob. Read in evening. 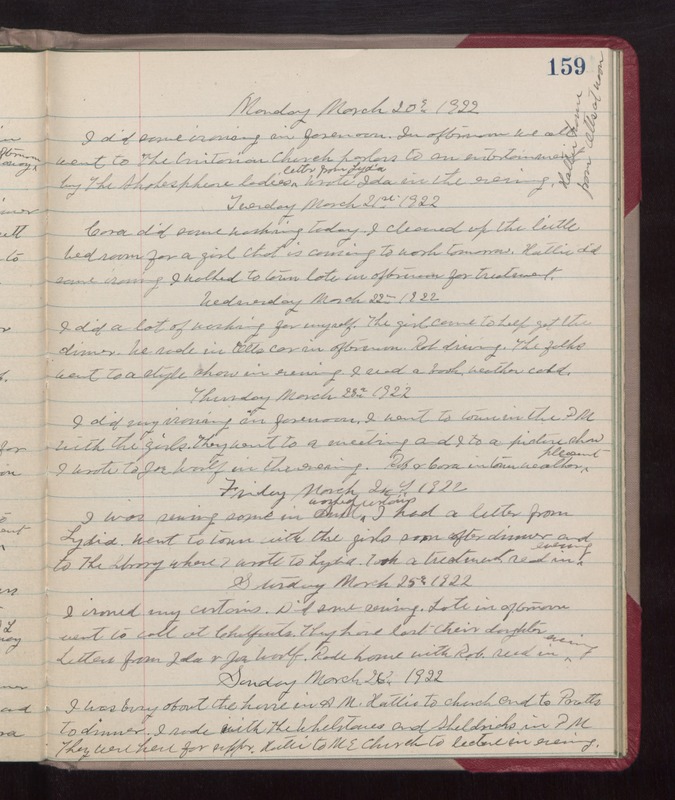 Sunday March 26th 1922 I was busy about the house in AM. Hattie to church and to Pratts to dinner. I rode with The Whetstones and Sheldricks in PM. They were here for supper. Hattie to M E Church to lecture in evening.